The role of the kitchen in the family household has changed a lot in recent years and it is now a lot more than just somewhere where the food preparation takes places. The dining table now tends to reside in the kitchen which has helped it to become a hub of family activity. The children can now sit in the same room as their parents while dinner is being prepared and the making and eating of food have developed into much more family inclusive experiences. So now that the kitchen is one of the busiest rooms in the house you may want to ensure that it shows off your personality and that it is the stylish centre of the home that it deserves to be. So whether you are creating your new kitchen from scratch or looking at just remodelling your existing one; here are some great ways to add style in abundance. It has become more and more popular to have an island in the middle of the kitchen which can create more space everywhere else. This island unit can be the main storage space, where everybody sits or even where the hob is situated, but it is important to make it stand out from the rest of the kitchen. By painting the unit a different colour to the rest of your cupboards it is sure to be set apart. You could even have the work surface on the island made in a different colour or design to the rest of the counter tops. The island is a great way to create a stylish focal point for your kitchen. The type of flooring that you choose in your kitchen can really set the president for the rest of the room and for a stylish solution you may wish to consider wooden flooring. Wooden floors look great in any room but are specifically perfect for the kitchen. They are very hygienic, easy to clean and durable enough to withstand the amount of attention your kitchen is sure to receive. Be sure to go with a trusted manufacturer though such as Kahrs or Boen as this will ensure that your floor withstands the test of time. Kahrs wooden flooring is a great foundation for your stylish kitchen and the perfect place to start your designing. If your crockery collection is all the same colour and you have a toaster and coffee maker to go with them then don’t hide them away; display them proudly. Grouping these items together in one area of the room is a great way to display them and will break up the colour of the rest of your kitchen. Another great way to do this is to paint the shelves inside your cupboards a different colour to the outside of the door. This way when you open the cupboard any exposed shelves will bring splashes of colour to your kitchen. The days where a kitchen is painted all one colour and the only things on the walls are cupboards and utensils are over, so don’t be afraid to bring your personality to your kitchen too. Bold colours, striking lighting features and intricate artwork can be as much at home in your kitchen as in any other room of the house. 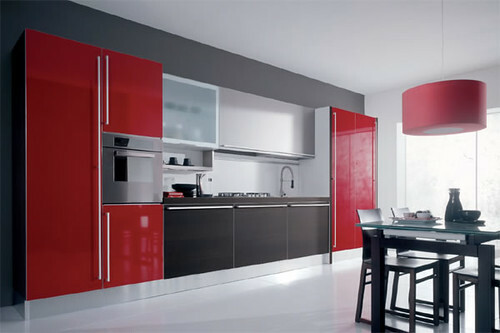 Express yourself and your kitchen will be as stylish as you want it to be. 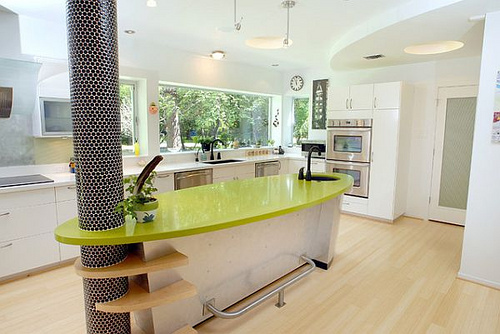 Chris Mayhew has just moved into a new home and is looking to redesign the kitchen. He is working for Oak Flooring Direct who provide high quality wooden flooring solutions from trusted manufacturers.